Dogs! Water! & Wondercide Flea & Tick Pets + Home! 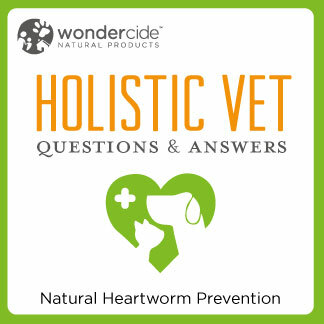 Home > Dogs & Cats > Frequently Asked Questions [FAQ] > Natural Solutions for Dogs > Question of the Day > Dogs! Water! 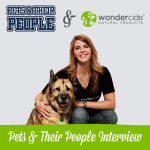 & Wondercide Flea & Tick Pets + Home! If my dog goes into the water, and then runs around and plays all over the other areas nearby, what is the best way to protect him with your natural flea spray? I’m thinking that I need to spray him before he goes into the water and then after when he is dry again? So, when you are ready to call it a day at the water and load up, dry off your dog, and spray him down well, focusing on legs, belly, and chest to ensure nothing is coming home with you. Flea & Tick Pets + Home is non-toxic, great for skin/coat, kills insects on contact, repels mosquitos, and is safe to use every day. While it may take a little longer to spray down a large dog, the 4 oz Flea & Tick Pets + Home is a great option for travel and hiking adventures any time you don’t want to bring along a larger bottle of natural flea & tick spray. The 4 oz bullet fits easily in large pockets or a backpack, so it’s super convenient when you’re on the go. 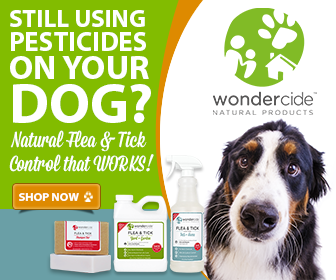 Wondercide Flea & Tick Pets + Home is made of human food-grade ingredients and age-defying moisturizers. Spray away and thanks for the question. Send us your questions at hello@wondercide.com! 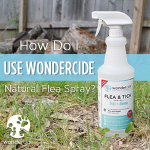 How Do I Use Flea & Tick for Pets + Home Natural Flea Spray? I am using my first bottle of your Wondercide, courtesy of someone on eBay selling me an entire flea-killing kit for $19.95. I also have 8 indoor-only cats that, in spite of whatever brand of flea-killing product I use, have never been able to be without fleas. I would very much like to know what you suggest me using, please? I am on a social security income so cost-effectiveness is a priority. Thank you. Btw: now that I’ve discovered you, I would never buy from anyone else; I love, love, love your product. God bless you. So glad you like Wondercide. For indoor-only cats, once you are able to kill the fleas that are currently ON the cats using Wondercide Flea & Tick for Pets + Home alone or with our pet shampoo bars, you can simply treat the environment (your house) to keep fleas away. The same product you’ve been using on the cats can be used indoors on the floors, furniture, pet bedding, etc. Since none of the cats go outdoors, it should be cost-effective to treat the home for preventing fleas instead of each individual cat. If your home has fleas, we do suggest treating the entire square footage once to knock out the life cycle. Feel free to call our PAWSitive Experience Team at 877-896-7426 if you have further questions!